The San Jose Blog: PAC*SJ Summer Walking Tours! You can also purchase tickets on the day of the tour if slots are available by arriving about 10 minutes early. Individual tickets are $10 for members of PAC*SJ and $15 for the general public. It is $25/$35 for the complete set. This walk shows six decades of San Jose homes on only four streets. The tour will begin at Ryland Park near First Street. There are some parking spaces in the Ryland Park lot and along San Pedro, but parking east of First Street or taking Light Rail to Ayer is recommended. In the park, we’ll learn a little history about San Jose and how the neighborhood filled in over time. The biggest growth spurt was during the 1930’s when the property of the Vendome Hotel became available for development. After we visit the Rotary Ryland Pool, we’ll stroll through the southern half of the neighborhood to see the homes. The architecture includes Victorian, Craftsman, Prairie style, Tudor, art moderne, and a wide variety of Spanish styles. This tour begins at the corner of Fuller and Bird in North Willow Glen where is more street parking available. We’ll pass some interesting homes on Bird, before going through Palm Haven. 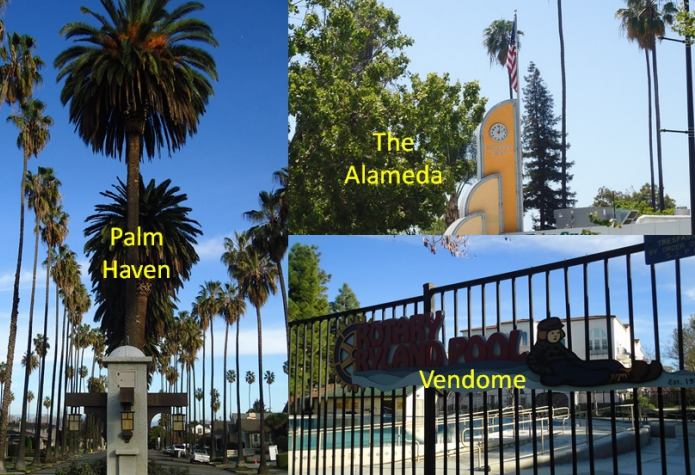 Palm Haven was laid out in 1913 with a border of Mexican Fan Palms. The earliest homes were all substantial. Later homes on the outer streets are more varied in size. Many famous civic and business leaders lived in Palm Haven, as well as artists and architects, most notably in the Wolfe family. The tour begins at the corner of Emory and the Alameda, across from the Central Y. The resources for this tour are The Alameda: The Beautiful Way and the Alameda Right of Way Context Statement produced by the City. The Alameda is the piece of the El Camino Real that ran between Mission Santa Clara and Pueblo de San Jose de Guadalupe. The name comes from the shade trees that were planted along the route. On the first part of the tour, we’ll look at the prominent homes along the street and discuss some of the ones that are now gone. We’ll learn about some prominent people in city history. Later we’ll walk through a resurgent business area and talk about the past – and future – changes to the landscape. The narrative will be finished as we approach Stockton Street after a 1 mile walk, so depending on the heat and how individuals are feeling, there is the option to take the #22 or #522 bus back to the starting point. They both run every 15 minutes. - Bird and Fuller is only a three minute bike ride from the Los Gatos Creek trail. - Its also only a three minute bike ride down West Virginia to the Guadalupe Creek trail. - Bus 64 arrives at Bird and Fuller every half hour, with an arrival at 10:07am.